We're honored to be named a Top 9 Pet Blogger by Holiday Lettings by Trip Advisor! Holiday Lettings is a TripAdvisor-run site that helps people find vacation homes. Vacationers can find places to stay all over the world. 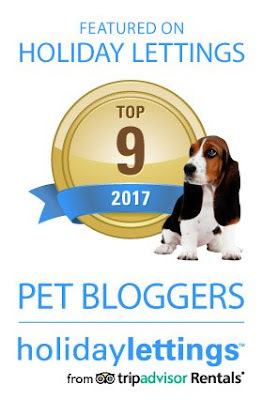 We at Life With Beagle are proud to share the 2017 Top pet blogger honor with some of our close friends, like Ty and Buster over at Go Pet Friendly, Cosmo at To Dog With Love and the gang over at The Lazy Pit Bull. Oh, and celebrity Dachshund Crusoe! Each of us got to give tips on traveling with pets and talk about some of our favorite pet-friendly places. I talked about St. Augustine, the oldest city in the United States, and definitely one of the pet-friendliest. Lulu on St. Augustine Beach. Lulu at the St. Francis Inn, the oldest lodge in St. Augustine. We love St. Augustine's ambiance. The downtown area has a small town feel, its artsy, there's always something going on. There are dog boutiques, plenty of patios where dogs are welcome, even some of the attractions, like the Old Spanish Hospital, are pet-friendly. There are pet friendly ghost tours and food tours. There are even pet-friendly eco tours. And dogs are allowed on St. Augustine Beach. In fact, when we looked up pet-friendly rentals in St. Augustine on Holiday Lettings -- we found 97! And that doesn't include hotels, motels and Bed and Breakfasts. You can find lots of those that accommodate pets. Holiday Lettings lets you search by property type, number of bedrooms and bathrooms, location and activities as well. Some of the listings we found on Holiday Lettings for St. Augustine. So thanks to Holiday Lettings for the honor! I have always preferred house rentals to any other accommodations. They were especially helpful when we had reactive pups. BTW, we love St Augustine too. We stay in the mooring field on our boat and the marina launch is pet-friendly so we don't even have to dinghy in to shore. I need to consider looking at that. I know people love Air BnB but I am so used to more traditional lodgings. Next time you're in St. augustine let me know. I'll come up for the day and meet you for some Spanish food. Or Irish food -- Meehan's back patio is pet friendly and they have homemade Irish cream. Soooo smooth.